A woman passes behind the world's largest superconducting solenoid magnet at European Organization for Nuclear Research (CERN)'s Large Hadron Collider (LHC) particule accelerator. 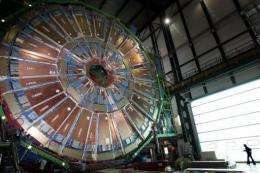 Israel's cabinet has announced that it has approved the country's membership of CERN, becoming the research group's first non-European delegation. Israel's cabinet on Sunday announced it had approved the country's membership in the European Organisation for Nuclear Research, becoming the research group's first non-European delegation. "Israel is joining an exclusive club, which provides unusual visibility, exposure, prestige and international status," Prime Minister Benjamin Netanyahu said in announcing the cabinet decision. He said membership in the organisation, known as CERN, reflected the "capabilities of Israeli scientists and constitutes recognition of their ability." Israel had previously held special observer status at the organisation, which is best known for its "atom-smasher," the so-called Large Hadron Collider which is installed in a tunnel straddling the Franco-Swiss border. Israel first joined the organisation in 1991 as an observer state, and became a special observer state in 2009, gaining the right to attend restricted sessions discussing the Large Hadron Collider. Israeli media reported that the Jewish state faced several hurdles in its bid to become a member, including French fears that Israeli access to CERN tenders could affect France's hi-tech industry. Switzerland reportedly expressed initial opposition to Israeli membership, citing Israel's occupation of the Palestinian territories. nice, the fact that the french hitech industry worries about the capabillities of israeli scientists/industry is a good testament of why i think they should be involved to bring this thing forward. a good chunk of today's hi-tech is coming out of Israel and they do have very clever folks.